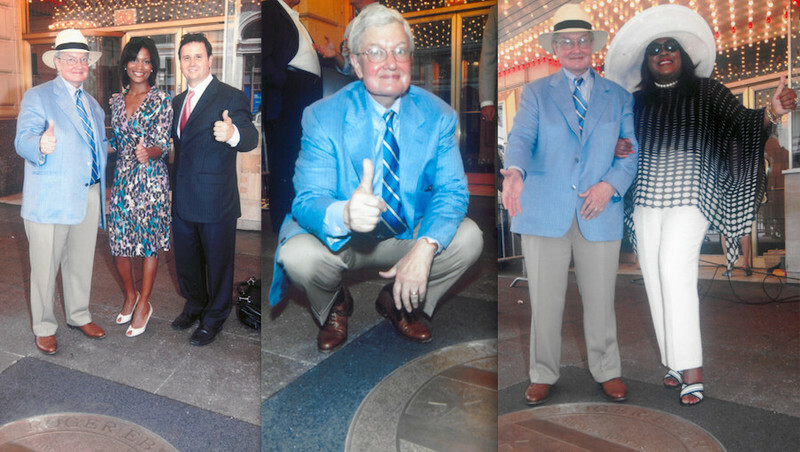 On the fourth anniversary of his death next Tuesday, April 4, friends, family and fans of acclaimed film critic Roger Ebert will gather at his lone star in front of the Chicago Theatre to celebrate his life and legacy, and to champion one of his favorite principles: Empathy. And toward that end, the Ebert Foundation that he and his wife, Chaz, founded together will award grants in Roger’s honor of $1,000 each to 21 organizations that are working to improve the lives of Chicagoans and advance the arts. Award-winning documentary filmmaker Steve James (Kartemquin Films, "Hoop Dreams"), director of the Ebert biopic "Life Itself," will be among special guests to attend the memorial ceremony at 11 a.m. outside the theater at 175 N. State St. A private reception will follow at 11:30 a.m. at the Gene Siskel Film Center of the School of the Art Institute across the street. Other special guests will include Gordon Quinn of Kartemquin Films; Marlene Iglitzen, widow of Gene Siskel; Father Michael Pfleger of St. Sabina Church; Michael Kutza, founder of the Chicago International Film Festival; Richard Roeper, Chicago Sun-Times chief film critic; Michael Phillips, Chicago Tribune chief film critic; Steve Cohen and Paula Froehle, co-founders of the Chicago Media Project; Nicole Bernardi-Reis, executive director, Independent Film Project Chicago; Dann Gire, board president, Chicago Film Critics Association; Rich Moskal, director of the Chicago Film Office; and Christine Dudley, director of the Illinois Film Office. Ability Lab (Shirley Ryan), formerly the Rehabilitation Institute of Chicago, which helped to improve Roger Ebert’s quality of life following his surgeries. Afterschool Matters, which supports life- and skills-building programs for youth. Chicago Film Critics Association, which supports professional, charitable and educational goals and takes a stand on important industry issues. Chicago Media Project, which brings people together to connect them with great media, support and amplify films, and do so in innovative ways. Chicago Shakespeare Theatre, known for vibrant productions that reflect Shakespeare’s genius for storytelling, language and empathy for the human condition. Crane Medical Preparatory High School, a magnet high school that will meet the growing demand for medical professionals by preparing a diverse student body to go on to the best colleges and universities. It is also Chaz Ebert’s alma mater (when it was Richard T. Crane High School). Creative Cypher, which champions diversity in the film industry to make it more accessible to independent artists. Deborah’s Place, which provides supportive housing to homeless single women. Donda’s House, which supports arts education and gives youth an outlet for creative expression. Family Focus, which helps low-income families give their children the best start in life. Free-Spirit Media, which offers hands-on, project-based media production opportunities for youth. Independent Film Project (IFP) Chicago, which provides programming and services designed to strengthen diverse artistic visions and enable filmmakers to create sustainable careers. Kartemquin Films, a collaborative center for documentary media makers who seek to foster a more engaged and empowered society. Lookingglass Theater, which shares its ensemble-based theatrical techniques with Chicago area students and teachers through educational and community programs. Love Foundation, whose founder Quentin Love feeds and clothes the needy every week at his West Humboldt Park restaurant. Mercy Home for Boys and Girls, which helps boys and girls escape abuse, poverty and neglect. Moms Against Senseless Killings, a neighborhood watch group that has helped make a block in Englewood violence-free. Rainbow PUSH Coalition, a multi-racial, multi-issue, progressive, international membership organization fighting for social change. St. Sabina Church, a predominately African American Catholic congregation on the South Side led by Father Michael Pfleger. 21st Century Dads, which improves the lives of children by raising awareness and resources for greater father involvement. Urban Prep Academy, an all-black male high school with a 100 percent graduation and college attendance rate. Roger Ebert was chief film critic for the Chicago Sun-Times for 46 years and co-star with Siskel, and later Richard Roeper, of the popular television series “At the Movies.” He died April 4, 2013, after a long cancer battle. His legacy lives on through the premier film criticism website RogerEbert.com; the Ebert Foundation; and the Ebert Center being developed at the University of Illinois Urbana-Champaign, his alma mater. The University of Chicago Press recently published the fourth and final edition of Roger Ebert’s “Great Movies” book series, which consists of 62 of his favorite reviews. The 19th annual Ebertfest, Roger Ebert’s film festival, will take place April 19–23 at the Virginia Theater in Champaign, Illinois. For the first time at Ebertfest, Chaz is bringing together the emerging writers, critics, filmmakers and technologists mentored through programs at the Sundance, Hawaii and Telluride film festivals, the Columbia College Links journalism program, the Chicago Urban League, and the University of Illinois to discuss empathy and compassion through the arts.